Even late adapting tech skeptics like me dig an occasional app. My fav triumvirate these days: Waze, Evernote, and Wunderlist. The Good Wife is a serial list writer, always has been, always will be, but she’s even later adapting than me meaning she puts “the old” in “school” meaning paper and pencil. If she dips her toes any further into the digital waters, Wunderlist might prove transformative. My dearest sissy is the “Queen of Apps”, but she doesn’t dare post on her brother’s or anyone’s blog, so if we’re lucky, she’ll email me with her current favs. What indispensable apps am I missing? iMiss the days when everyone in and around Apple was afraid to death of Steve Jobs and what he would do if there was a leak. Far less was known prior to major pressers like this Tuesdays. Predictions. More incremental improvements to the world’s best smart phone. Larger, sharper, more durable screens; faster processors; more memory, improved battery life. iPhone 6 users will soon be paying for all sorts of things by quickly swiping their phones. 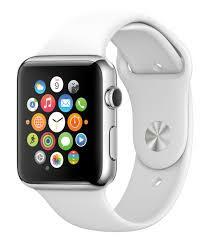 An iWatch that keeps time more accurately than any previous watch ever. All of your social media on your wrist all of the time. Steadily declining marketshare for the top-selling personal fitness and health devices. Wireless charging. Analysts will complain the products cost too much. On Friday, AAPL shareholders like me will have less money that we do right now. People will find the money for both products. Fourth quarter 2014 and first quarter 2015 sales will set new records and exceed almost everyone’s expectations. The stock will recover and sometime soon the Good Wife and I will once again start eating at Vic’s on Saturday nights. The products will not improve the quality of my life. I will not free up more time or experience more joy. I will not be more insightful. I will not write or teach any better. I will not listen more patiently or find more humor in things. I will not be more kind or generous. I will not display greater appreciation for my health or the natural world. Take this prediction to the bank. No combination of sleek and shiny iProducts will make me a better person or improve the quality of my iLife. Make like Stuart Smalley and repeat that mantra in the mirror this week and let the iHype pass over you. You STILL Have a Wired Doorbell?! A wonderfully quiet, calm, early morning. Just me and the iPad Air, on a stool, at the kitchen island. I’m George Foreman and my green tea latte, banana with peanut butter, and bowl of oatmeal are Frazier. I open ZITE and select one of my “Top Stories”, an article titled “Interior Design Tips & Furniture To Consider When Moving Into a New Home”. I want to be prepared in case I buy a new home today. Scrolling, scrolling, some cool ideas like a pallet coffee table or a “murphy bed for the kids’ room”. Then the game changer. “Connect With Your Home Via Your Smartphone.” Here’s the paragraph. Savor. Every. Word. These days our smartphones can do almost anything. There’s an app for everything so why not take advantage of this? 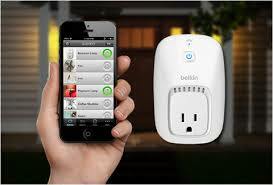 In your home, you can have things like a wireless doorbell. Whenever someone’s at the door your phone will ring so, even if you’re in the garden, you’ll hear the doorbell. Our smartphones. Never be lonely again. We’re a club and you’re in it. There’s an app for everything. 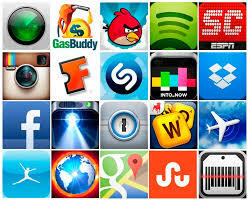 I have read there are a whole lot of apps, but I never knew there’s one for everything. Had I known about the one that heals calf muscles, I would’ve been running all January and February. And had I known about the app that enables you to peer into the near future, I would’ve avoided last weeks argument with the GalPal. And had I known about the ones that rake leaves, mow, and pick up doggie do, I would’ve spent all weekend inside learning more about interior design. A wireless doorbell. Hot damn. Whenever someone’s at the door your phone will ring so, even if you’re in the garden, you’ll hear the doorbell. Until now, I thought my most pressing hardships in life were health related—persistent skin cancer, an enlarged prostate, worsening vision. Now that I think about it, I have long been tormented by a litany of missed house guests as a result of my feeble, wired door bell, and my gardening. Because thanks to technology, we have way more time on our hands than ever before and we’re spending a lot of that freed up time dropping in on one another. Just the other day, three young women stopped by to give me a birthday present, an advanced copy of the Sports Illustrated Swimsuit Edition. They emailed me later to say they rang the doorbell and waited as long as they could. I guess that’s why Marley was barking so excitedly. At the time I was knee deep in compost. And then a few weeks ago, Jimmy Fallon stopped by to ask if I would be his first guest on the Tonight Show. He emailed me later to say he rang the doorbell and waited as long as he could. At the time I was planting seeds. And then a few months ago, President Obama stopped by to see if I wanted to play golf and help troubleshoot the Affordable Care rollout. He emailed me later to say he rang the bell and waited as long as the Secret Service would let him. At the time I was stringing up some snap peas. And then a year ago, Kate Middleton stopped by to ask for some parenting advice. She emailed me later to say she rang the bell and waited as long as MI6 would let her. At the time I was installing a drip water system into a raised garden bed. And then two years ago, Pope Benedict XVI stopped by for some personal counseling. He emailed me later to say he rang the bell and waited as long as the Gendarmie Corps of Vatican City State would let him. At the time I was weeding. Someday, I will gather my children’s children around and tell them exactly what it was like to live through the wired doorbell era. I won’t spare their feelings and I’ll use big words like “distressing”, “harrowing”, and “horrifying” because they’ll be sups smart. One of my fondest childhood memories involves my older brother who loved making my life miserable. He routinely read the morning sports page and comics while eating toast weighted down by peanut butter and honey. Inevitably, a few drops of the honey would spill over onto the paper, so that when our dad read it, pages would stick together. Prompting dad to snap and drop a “g*d dammit” much to my delight. Fast forward forty years to our Olympia, WA breakfast table. The GalPal and I grew up in newspaper reading families so we’re part of the diminishing newspaper reading minority. 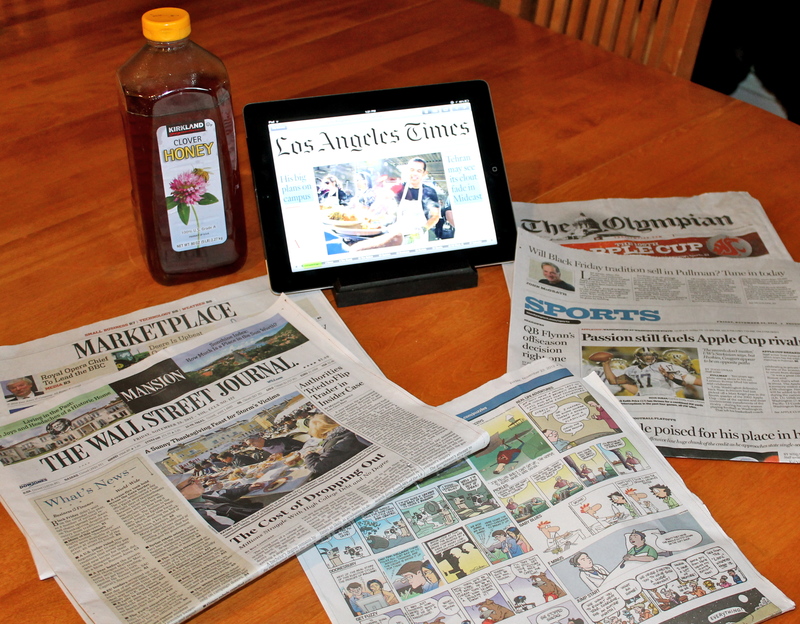 I read lots of local and national newspapers on my laptop and iPad. But as you know, the heavy hitters—led by the New York Times—have started to charge for more than very minimal access. We have a local paper weekend subscription which runs $13.33/month or $160/year. 52 weekends times three days equals 156 issues a year at a cost of $1.02/per. That’s a terrible value, but it’s a concession to marital peace. For some reason Betrothed has to hold the paper in her hands on the weekends. I hear divorce costs more than $160. And we subscribe to the Wall Street Journal which runs $8.33/month or $100/year. That’s the educator’s discount price. The regular price is three times more at $26/month. 52 weeks times six days minus holidays equals about 305 issues/year at a cost of 32.7¢/per for me and 98¢ for the masses. That’s for home delivery and complete digital access on any device. The WSJ subscription is about to expire and I’m thinking about switching to the New York Times digital/tablet edition. No home delivery. Unlimited access on any computer and tablet. Smart phone access is a little more. Educator’s discount price, $10/month; regular price, $20/month. That’s $120/year for 365 issues meaning about 32.9¢/per for me and 66¢ for the masses. Another option is PressReader, the best choice for serious news junkies. It’s like a cocaine addict buying a personal cocoa field. For $30/month subscribers gain access to 2,300 newspapers from 95 countries, representing 54 languages. Here’s a 4+ minute video introduction. They’ve provided me with a sample subscription which I’ve been trying out. It’s a promising application, but it may not have your local paper. Also, it takes 10-15 seconds for papers to download and moving around within papers takes some getting used to. If it was my only option, I’d adjust quickly and like it, but I’m going to pass on paying three times more for way more content than it’s possible to process. As if the newspaper subscription water isn’t muddy enough, two more options include the online news aggregator Zite which I’ve reviewed before (here) and Pulse another news aggregator which I really like and highly recommend (both available at iTunes). Pulse works especially well for skimmers. In fact, I dare you to find a rival. For the love of all things digital, someone please convince the GalPal the answer is obvious. Read the local paper online, use $120 of that $160 in savings to subscribe to the New York Times, and use the remaining $40 to buy more dried mangos.